This unique Cyclemaster was built by a good friend of mine. 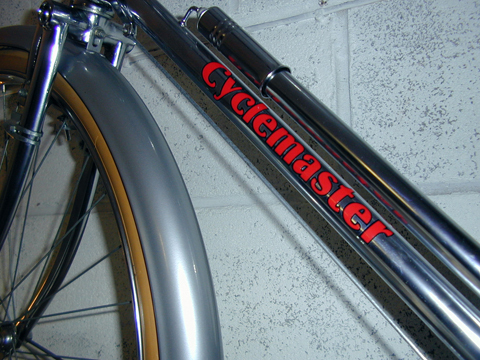 I could not resist buying it as it is undoubtedly the most splendid Cyclemaster in the world. 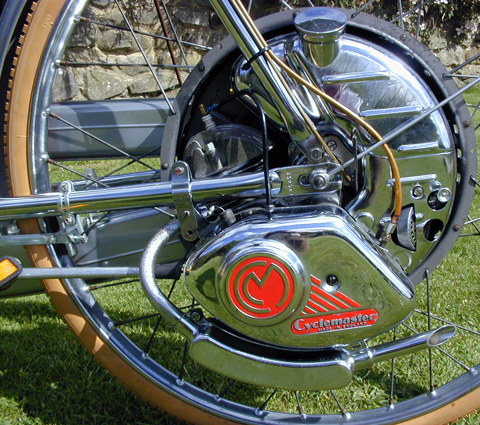 No expense was spared in the preparation of the bicycle or its engine. 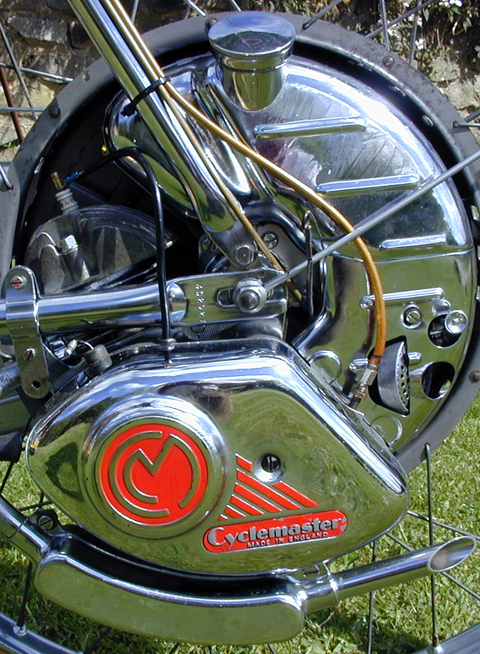 Cyclemaster engines normally come with 26 inch wheels, though Cyclemaster did produce a small number of them with a 28 inch wheel. 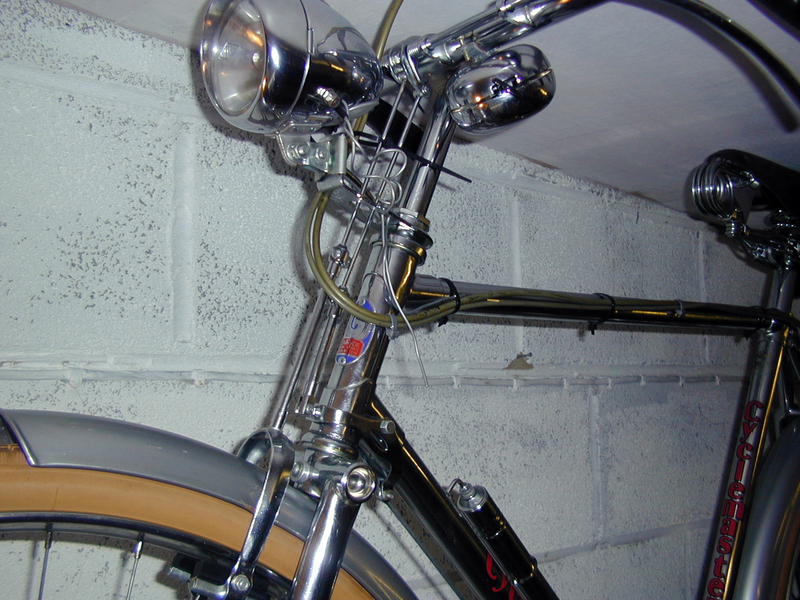 The recommissioned and fully chromed engine complements the bicycle perfectly. 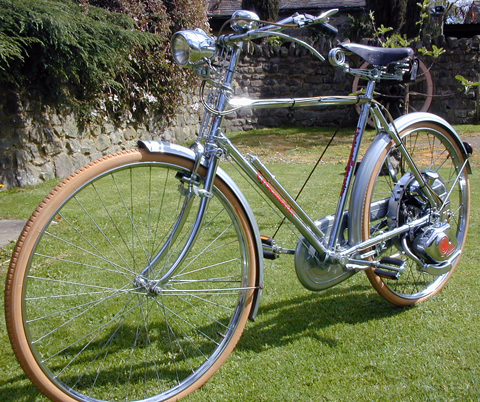 This Comrade All-Chrome bicycle was actually part of a consignment due to be shipped to the Middle East. But the Arab state concerned cancelled the order …luckily for us, I suppose, as otherwise we’d be unlikely to see this wonderful work of art. Simeon Taylor had a shop at 76 Pinfold Street, where he sold sports goods, and repaired bicycles at the back. He suffered from hearing difficulties and so his wife helped in the business. The Taylor family lived upstairs above the shop and had several children. Simeon built a workshop and started to assemble bicycles. Sometime later Simeon purchased an old nut and bolt factory on The Leys, in between Alma Street and Stafford Road, in which to manufacture bicycles and tricycles. The factory was previously occupied by David Harper & Sons. It became a family business. Simeon’s daughter Florence, sons Jack and Richard, grandsons John and Philip*, and granddaughter Lynda also worked at the factory. They became well known for their high standard of craftsmanship. Simeon died in 1960 after a long illness. By this time half of the company’s products were exported, and many competitors had ceased to trade because of cheap foreign competition. Comrade went on to become the largest independent cycle manufacturer in the country. The company was hit by the recession in the late 1970s and 1980s, and moved to new premises near the Bull Stake. Unfortunately it all came to an end in 1987 because of the continuing recession, and the large number of cheap foreign imports that flooded the market. 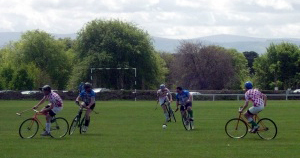 * Philip Taylor is now the president of The Bicycle Association of Great Britain. 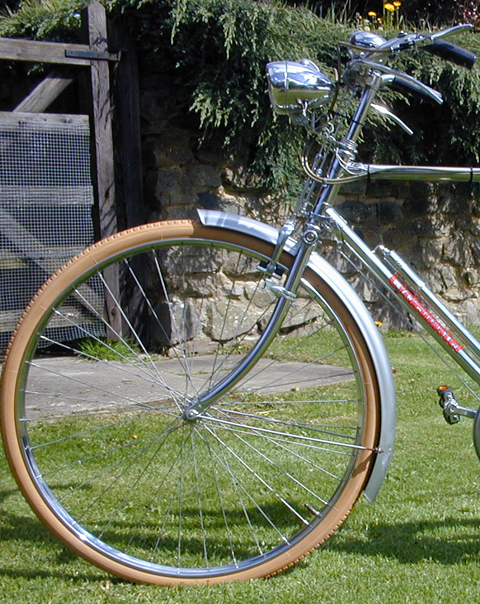 British bicycle manufacturers have, throughout the lifetime of the bicycle, been a major part of the British export trade. 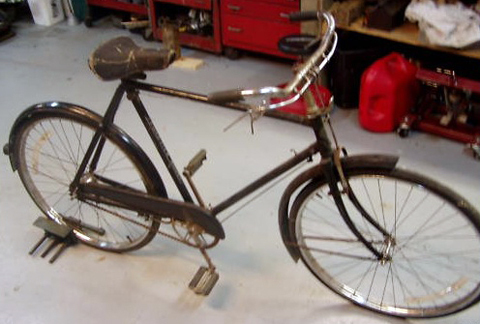 In the late 1940s, the Government helped the bicycle industry with exports in order to generate much-needed foreign exchange. 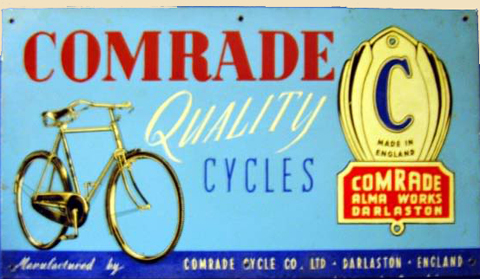 Along with the other bicycle manufacturers, Comrade sold their bicycles in the USA. 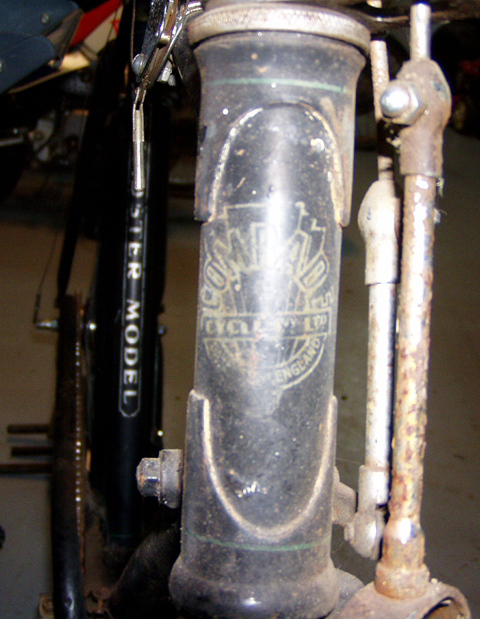 The bicycle pictured above and below is a 1948 Comrade Roadster. 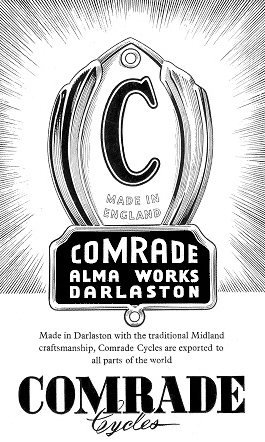 It was for sale in America, and the owner (Jim) kindly sent me an extra picture of the head-badge to add to this Comrade Cycle Co information page. 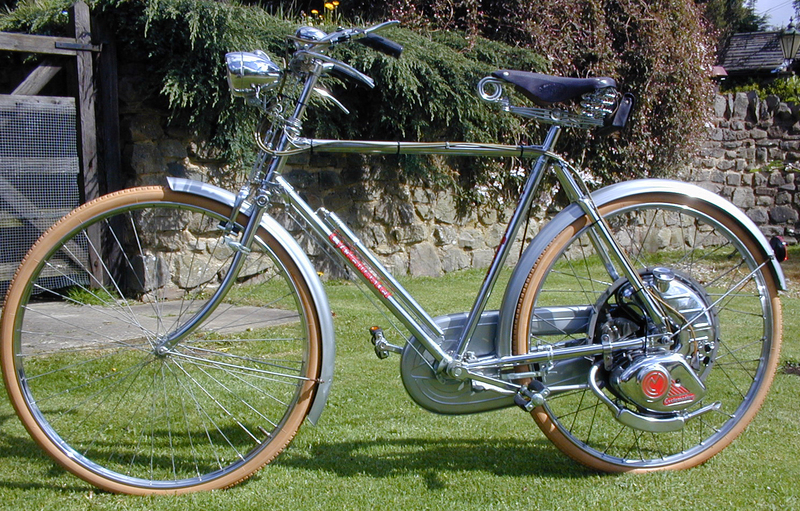 By the late 1960s, British bicycle exports were generally double that of manufacturers’ domestic market. Around this time, another important British export market was Nigeria. Both Raleigh and Comrade established factories there in order to assist with the supply and sales to the rest of Africa. 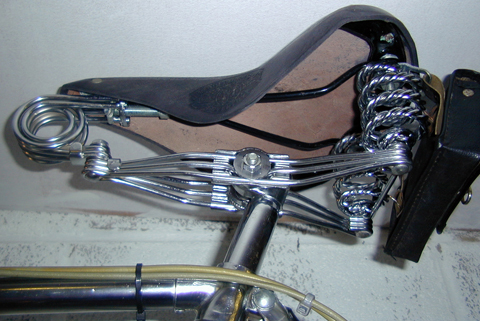 An All-Chrome ‘Boss Bike’ model was used by both companies for promotion work. Nigeria still has a love-hate relationship wit the bicycle as a source of transportation. To some, it represents the past, and therefore painful memories of colonial rule, and poorer times when a bicycle was the only affordable transport. But, despite poor roads and danger from motorized vehicles, the bicycle is an ideal form of cheap transport and it helps keep its rider fit. The Nigerian Transport Minister, Chief Ojo Maduekwe, became as one of Africa’s most vocal proponents of cycling, despite being hit by a bus and forced into a ditch while cycling in 2001. 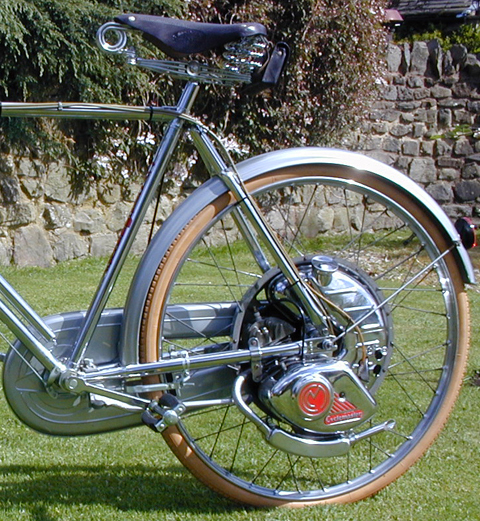 This top restoration is very much in the French tradition of cyclemotoring; from that I mean that rather than a cyclemotor being a cheap substitute for a ‘real’ motorcycle, as they were in Great Britain when they originally came out in the early fifties, this one is an upmarket product that has cost more to create than the average motorcycle (just like the French Cucciolo machines adopted by the top French bicycle ‘constructeurs.’ This machine is a design classic in its own right, and is part of Cyclemaster history.